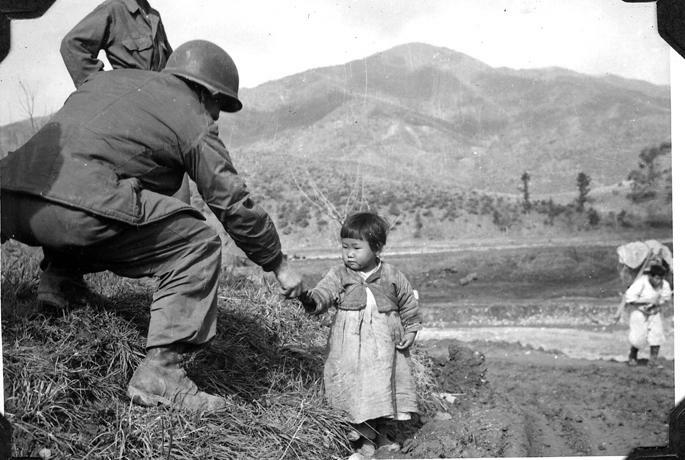 The Korean War was a civil and military struggle that was fought on the Korean Peninsula from 1950-1953. Some consider this Cold War conflict to have been a proxy war between the U.S. and its democratic allies against the Communist powers of China and the U.S.S.R. 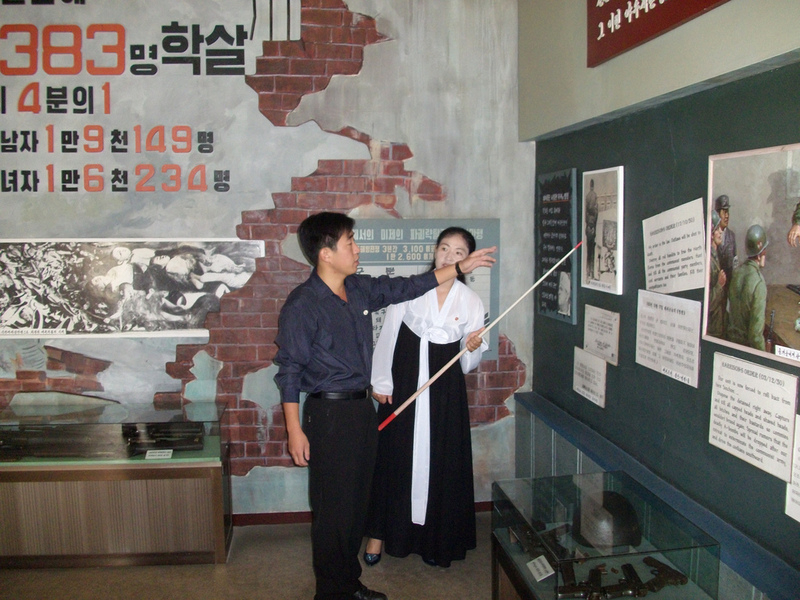 In the U.S., this engagement was termed a UN "police action" and called the Korean Conflict instead of the Korean War. This was done in order to cut out the need for Congress to declare war. In South Korea, the war is called the "June 25th Incident". In North Korea, the war is called the "Fatherland Liberation War". In China, the war is called "The Resisting American War to Aid Korea". Whatever its name, the conflict is sometimes known as the "Forgotten War" because it fell between World War II and the Vietnam War. 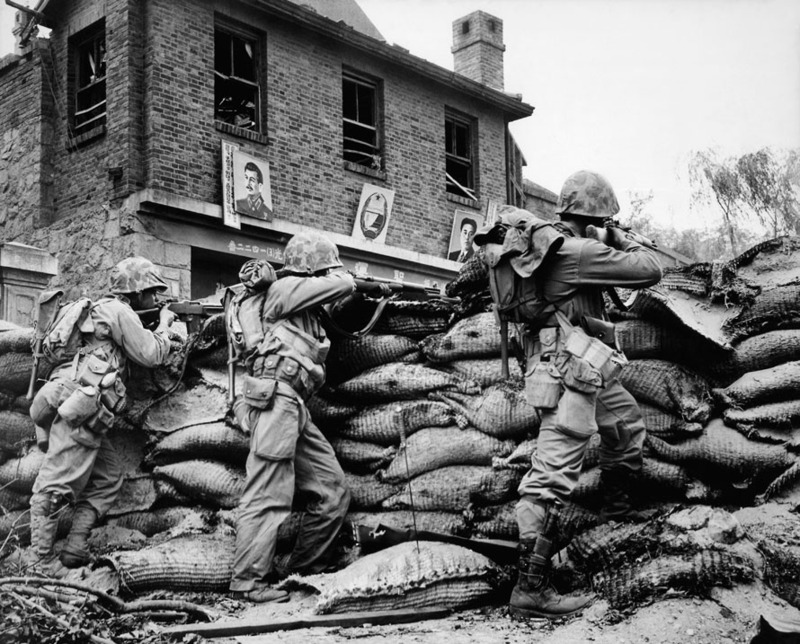 American involvement in Korea grew out of events that took place during World War II and the early years of the Cold War. When the Japanese occupied China in 1937, the long civil war (that began in 1927) between Chinese Communists and Chinese Nationalists was temporarily interrupted. The two sides joined together to fight against the Japanese invaders. After Japan was defeated and driven from China, the two sides renewed their civil war. The Communists under Mao Zedong led the struggle in the north while the Nationalists under China's President Chiang Kai-shek fought in the south. The U.S. sent the Nationalists $3 billion in aid. The aid wasn't enough to save the Nationalists, whose weak military leadership drove the peasants to the Communist side. In May 1949, Chiang and his demoralized army fled to Taiwan. On October 1, 1949, Mao Zedong named himself head of state and proclaimed the existence of the People's Republic of China. The U.S. public was stunned that China had become Communist. In their eyes, containment had failed. What's better than 1 Korea? TWO! 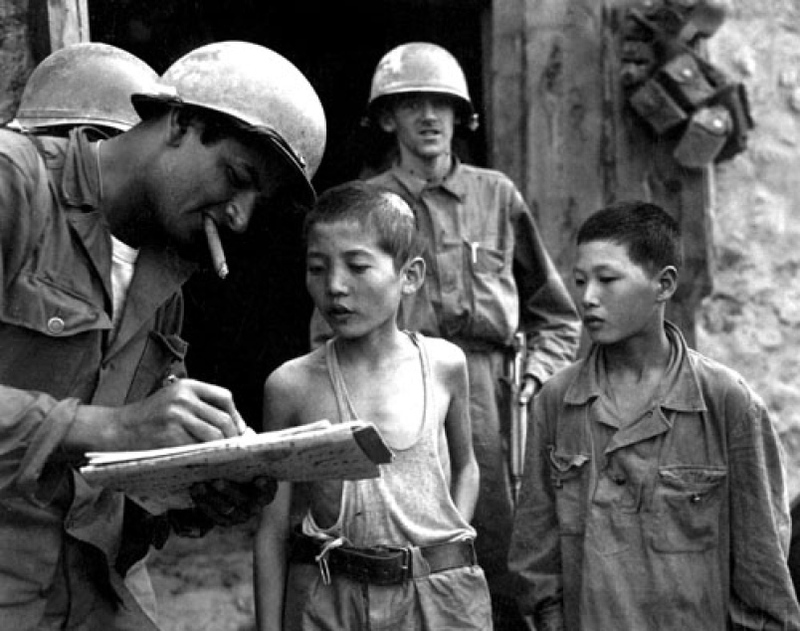 The Korean War was the result of the division of Korea. Despite its long history as an independent kingdom, Korea had been forcibly annexed by Japan in 1910. 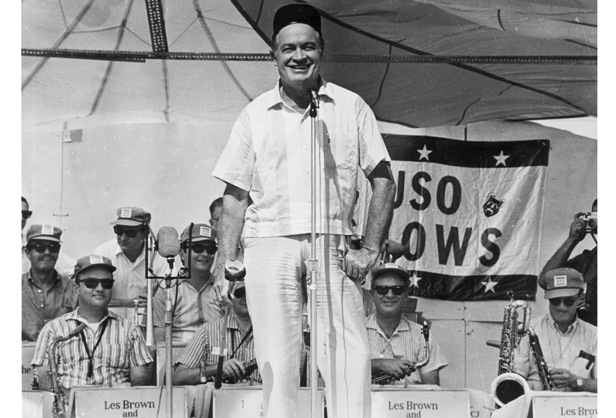 As World War II was coming to a close, the U.S. decided it would occupy the southern half. The U.S. Government did so out of fear that the U.S.S.R. (which had joined the fight against Japan in the northern part) would take control of the entire Korean Peninsula. 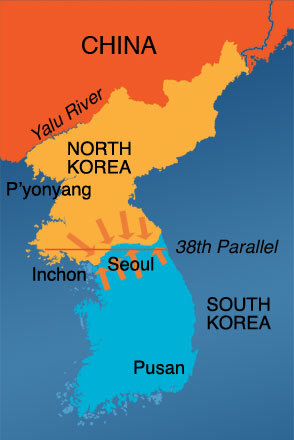 American planners chose to divide Korea at the 38th parallel because it would keep the capital city, Seoul, in the American zone. 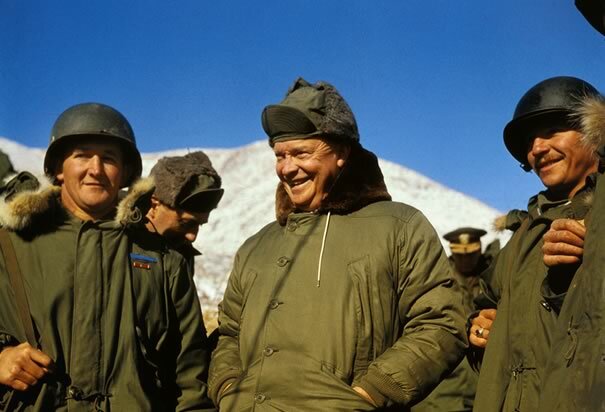 Both the Soviet Union and the U.S. crafted regimes in their halves of Korea that supported their interests. In so doing, however, the U.S. had to juggle both left-wing and right-wing political views in South Korea. That got to be exhausting, so, the U.S. simplified things by suppressing the leftist movement and tossed its support toward a 70-year-old refugee named Syngman Rhee. Rhee, who was anti-Communist and had lived for several decades in the U.S., was popular with the right. (The key term there is anti-Communist... Rhee could've been a serial killer, but, as long as he hated Communism... game on.) In North Korea, the Soviets backed the left and a 33-year-old named Kim Il Sung. By 1948, the two sides were cemented into place... the Republic of Korea (ROK) emerged in the South under Rhee (and had the blessing of the U.S. and the UN), while the Democratic People's Republic of Korea (DPRK) developed in the North under Kim (who was protected by the U.S.S.R. and China). Is anyone else confused by all this democratic and republic stuff? Click here for some help. 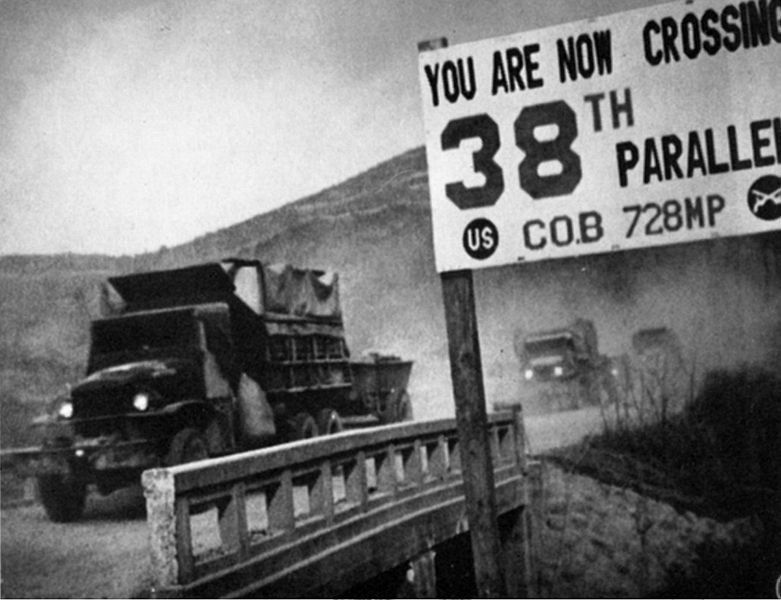 By 1949, both North and South Korea were stockpiling troops along the 38th parallel. In May 1949, sporadic fighting broke out and continued through December. 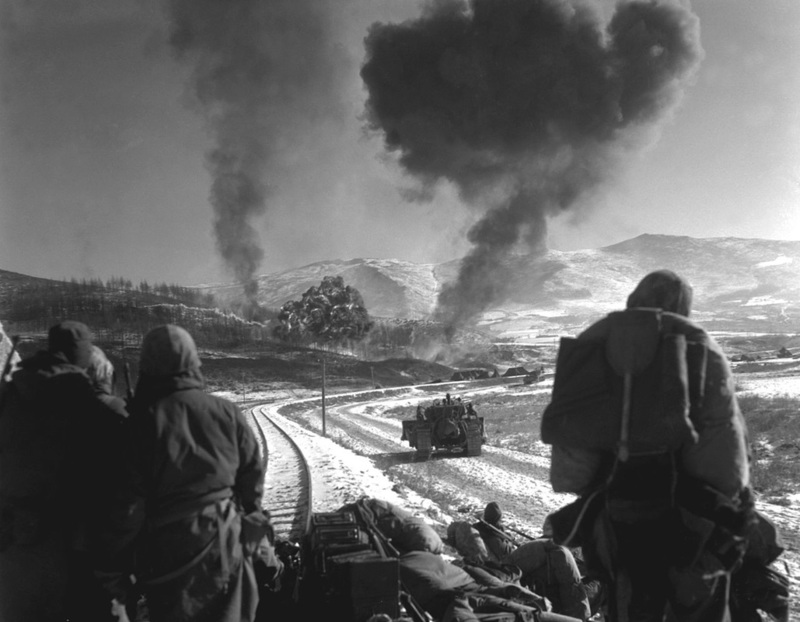 South Korea had provoked most of the border fights, prompting American advisers to restrain the South. 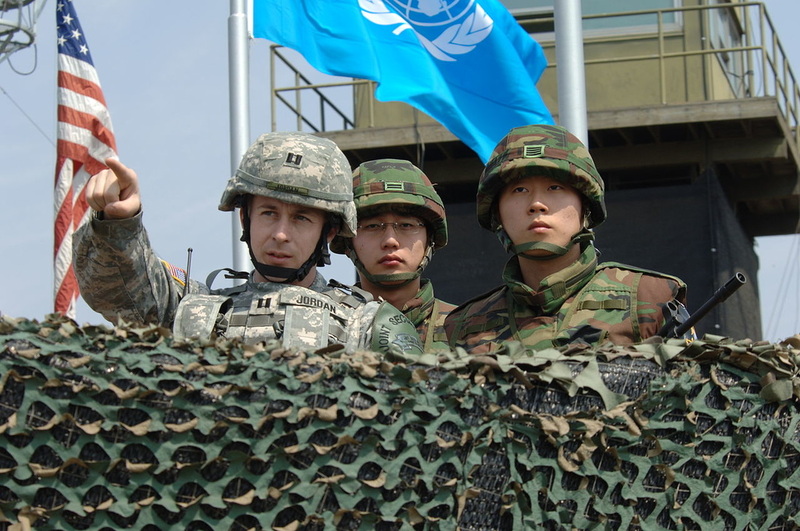 After a U.S. request, UN military observers were dispatched to Korea. But it was too late. 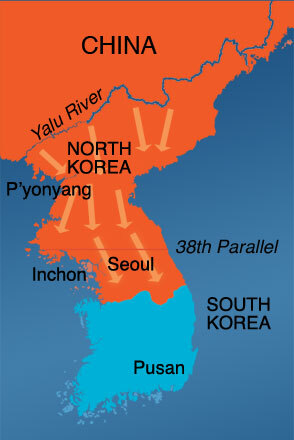 North Korea's Kim Il Sung had enough and launched an invasion across the parallel in the early morning hours of June 25, 1950. Fighting began around 3:00 or 4:00am on June 25th. By June 28th, the ROK Government fled Seoul, which was taken by 37,000 North Korean troops. Despite objections from U.S. military commanders that Korea was the wrong place to take a stand against Communism, President Truman committed American air and ground forces to the fight. In an effort to make his decision seem "cool with" the rest of the world, Truman did not take the issue to Congress, as required by that silly little document called the Constitution. Instead, he took it to the UN Security Council, which approved the motion. (And why not? 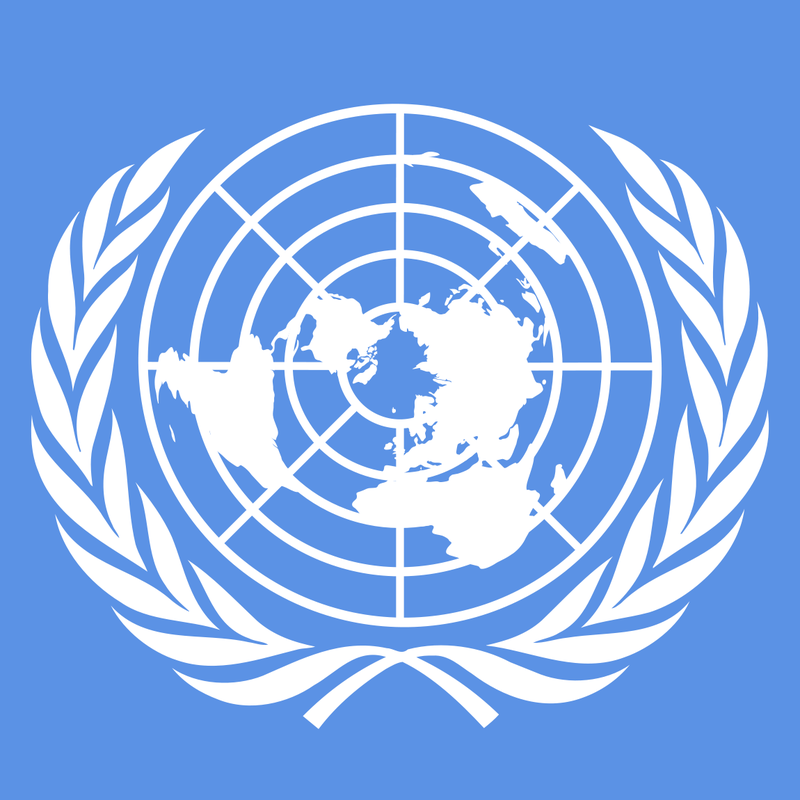 The UN is nothing more than American troops in powder blue helmets...) Truman used semantics to defend the decision not to ask for a formal declaration of war from Congress. If the word "war" was never mentioned, Truman argued that a President could send troops anywhere in the world for any purpose. As such, Korea became a "police action", the first of many undeclared conflicts during the Cold War. General Douglas MacArthur, a WWII hero, was placed in command of U.S. troops. Ever notice what often happens to football and basketball teams that find themselves ranked #1 in the country? They get so wrapped up in being at the top that they expect their opponents to be intimidated and roll over upon their arrival. And before ESPN can feature them on SportsCenter, the #1 team in the land finds themselves getting smoked by some unknown squad. Sadly, the same fate fate would await the #1 Army in the world. 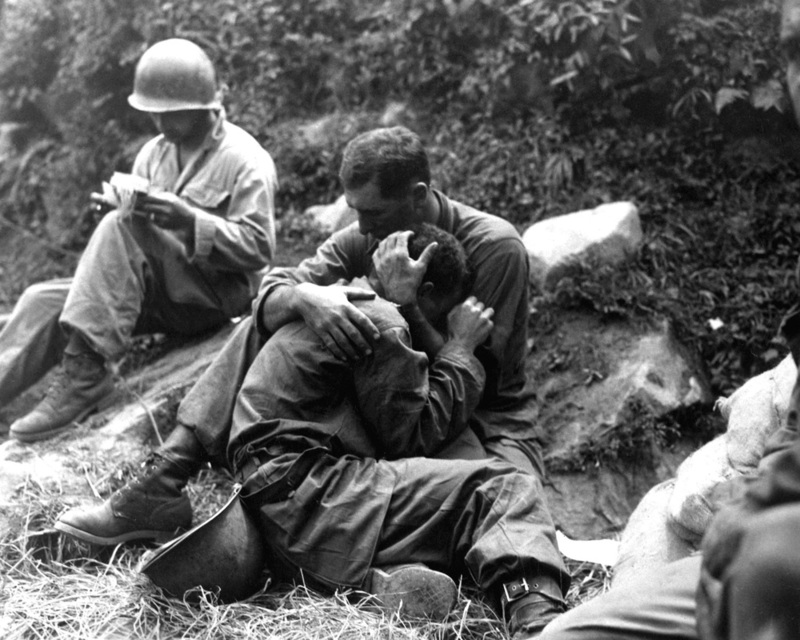 During the summer of 1950, the North Koreans inflicted humiliating defeat after humiliating defeat on American forces. Yes, the same U.S. Army that had defeated the Nazis and Japanese in World War II now found itself overwhelmed by an ill-equipped "peasant army". (In a sense, we started to understand how frustrated the British must've been during the American Revolution.) 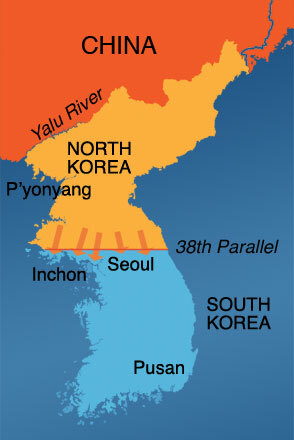 By the end of July, North Korean forces occupied 90% of South Korea. In fact, South Korea had actually lost MORE ground since the arrival of American troops. The U.S. was getting embarrassed... and the whole world was watching. 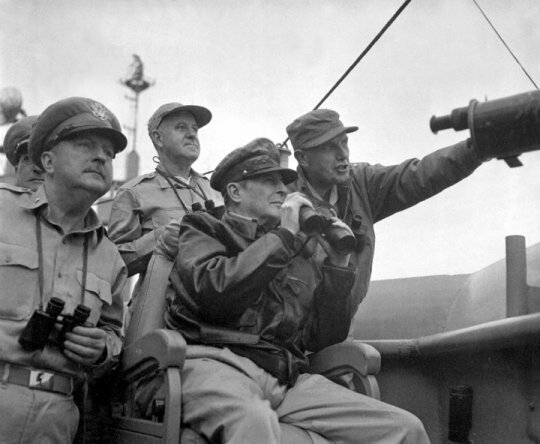 After some "pep" talks by General MacArthur (the kind that would make Bobby Knight blush), U.S. and South Korean forces stabilized, but found that they only controlled a small area called the Pusan Perimeter. 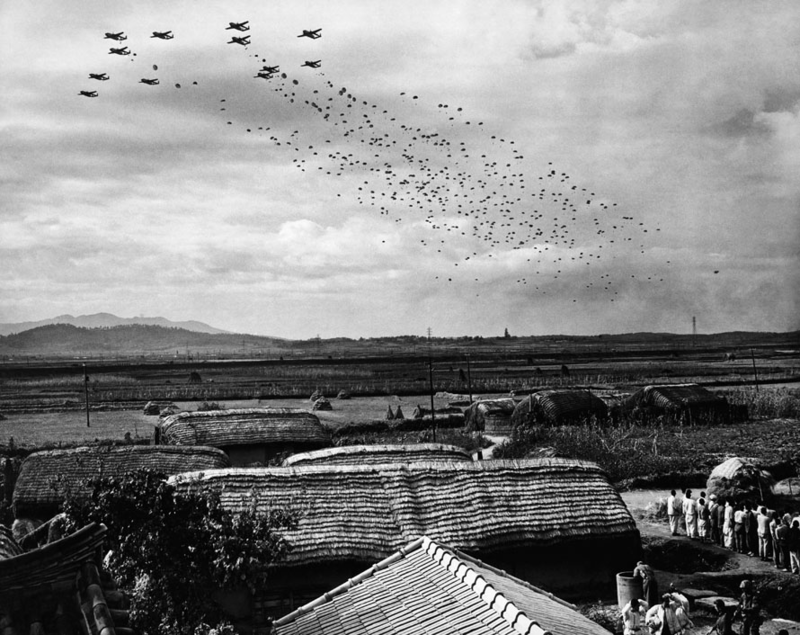 The U.S. held on, but suffered 20,000 casualties (including 4,280 dead) in the process. 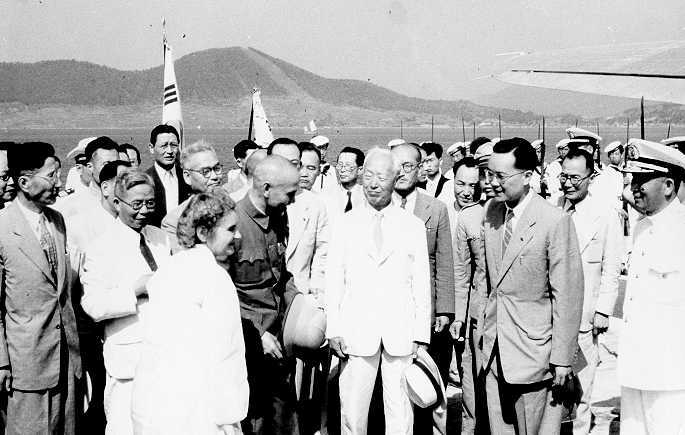 In mid-September 1950, MacArthur oversaw an amphibious landing at Incheon, a port 22 miles west of Seoul. 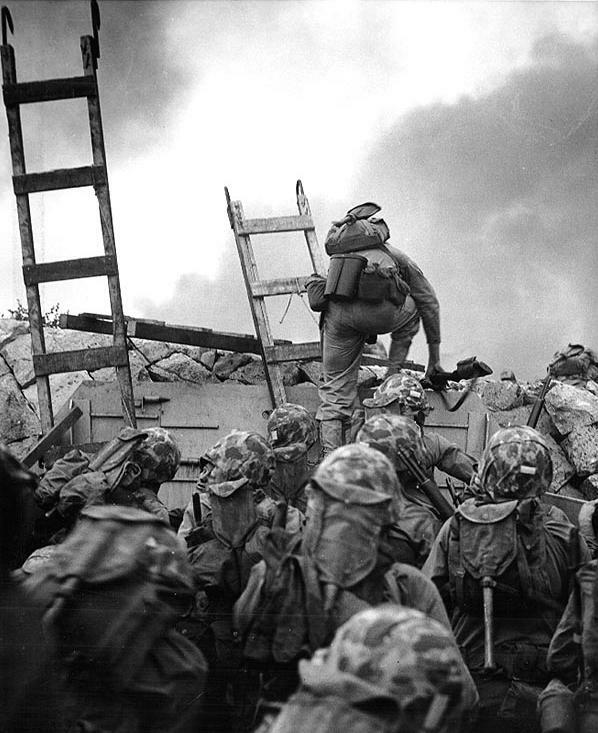 Although the Marines landed almost unopposed, they faced a deadly gauntlet before arriving at Seoul. 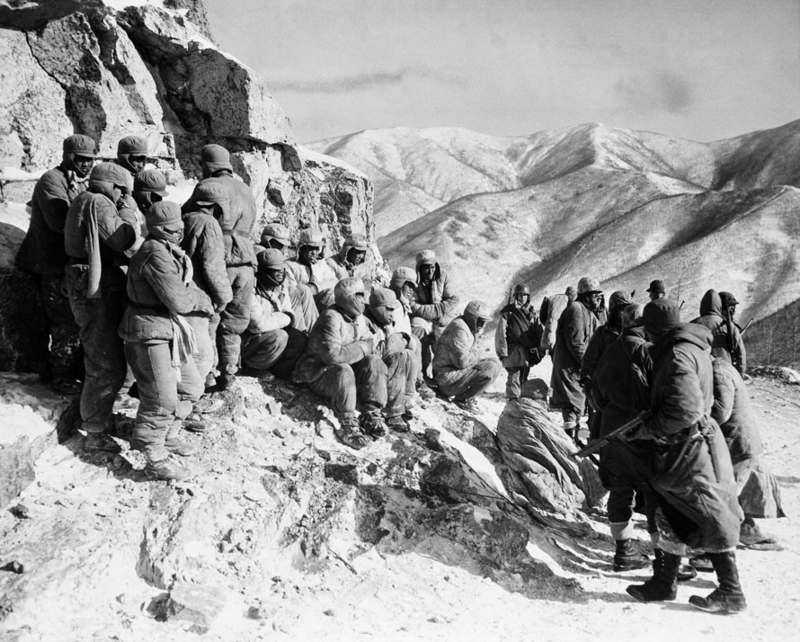 By the end of the month, U.S. forces fought their way into Seoul and recaptured the capital. With the North Koreans on the run, the U.S. could have reestablished the 38th parallel, ended the war, declared that Truman's policy of containing Communism had been achieved, and gone home. Buuuuuuuuut, instead, the UN had the bright idea that MacArthur should cross the 38th and reunite Korea. Truman saw his chance to not only contain Communism... but to crush it. After crossing the 38th, MacArthur was instructed to only use South Korean troops as he got closer to the Chinese border. ("Operation Use Just Koreans" sound a bit racist to anyone else?) The U.S. did not want to spook China and draw them into the conflict. 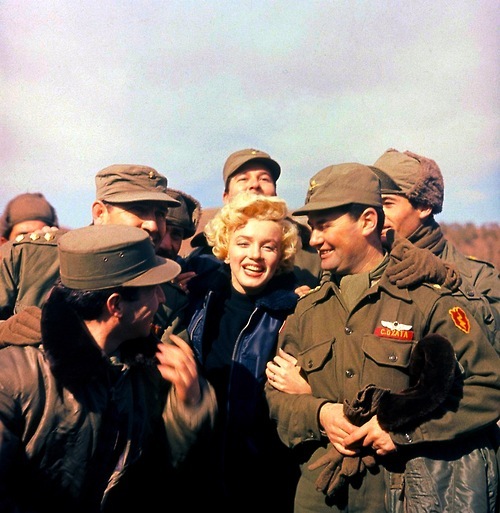 So, onward MacArthur swept, and UN troops captured the North Korean capital of P’yŏngyang by October. Of course, the worst case scenario then played out. 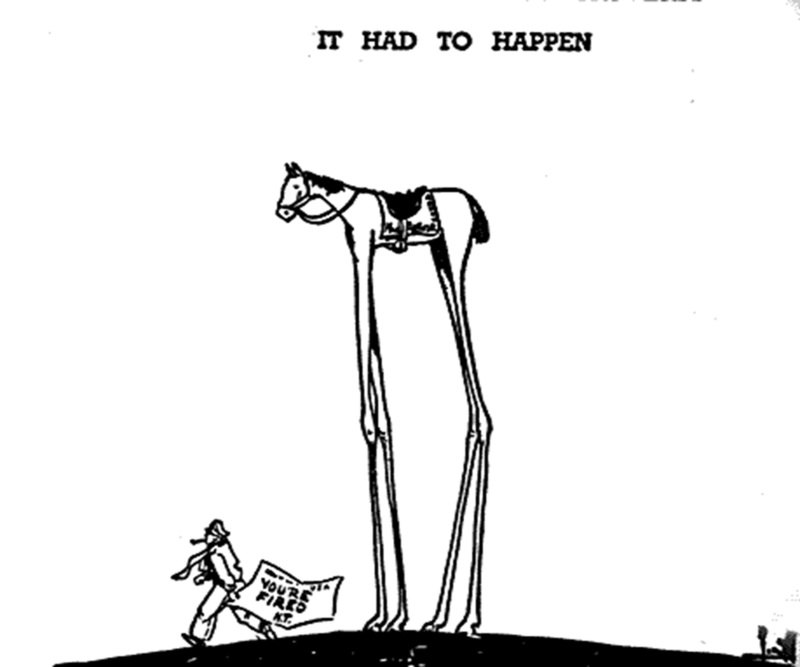 China, who wasn't a big fan of the American idea to end North Korean Communism, decided to attack the unsuspecting UN troops. The 20,000 U.S. and UN troops didn't stand a chance. 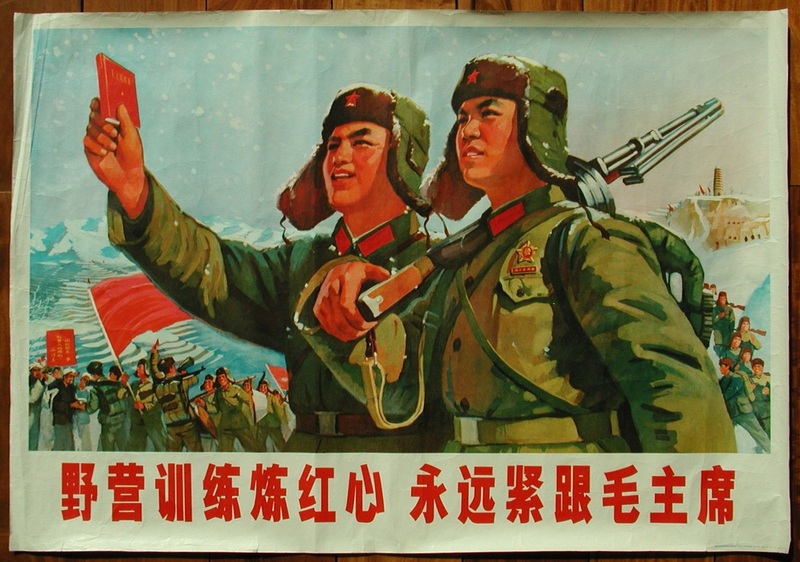 In late November, they faced over 200,000 mad Chinese and North Koreans. 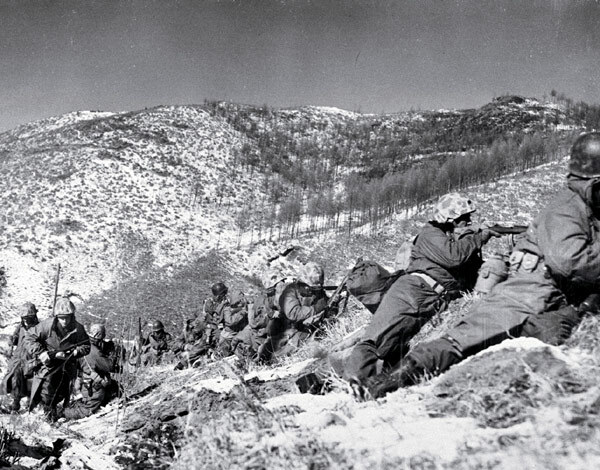 Suddenly, the U.S. 1st Marine Division found itself pinned down at the Chosin Reservoir. A brutal battle in freezing weather with temperatures dipping as low as 100 degrees below zero with the wind chill made it all the more difficult. 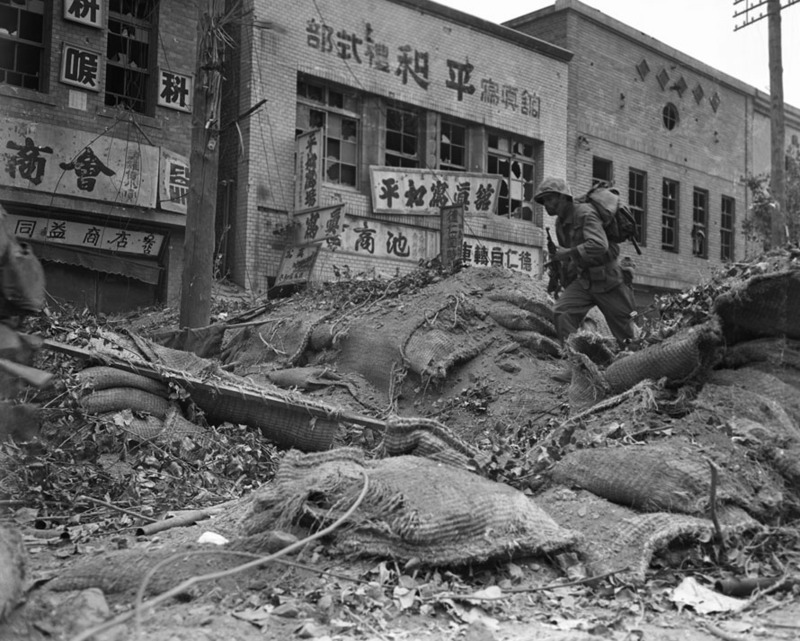 In their withdrawal, however, the Marines were able to destroy the attacking Chinese divisions that tried to block their escape. Despite the heroism of the Marines, it was decided the time had come to abandon taking North Korea. The Chinese lost 67,500 soldiers (30,000 suffered from frostbite) while UN forces lost 15,000 soldiers (7,500 cold-related injuries). In just two weeks, North Korea was cleared of all U.S. and UN troops. But the war didn't stop there. Because the UN got greedy and tried to eliminate Communism from Korea, the Chinese decided they wanted to rid Korea of democracy. So, on New Year's Eve, Chinese and North Korean troops crossed the 38th and captured Seoul... again... in what is considered the worst American defeat since the Battle of Bull Run in 1861. 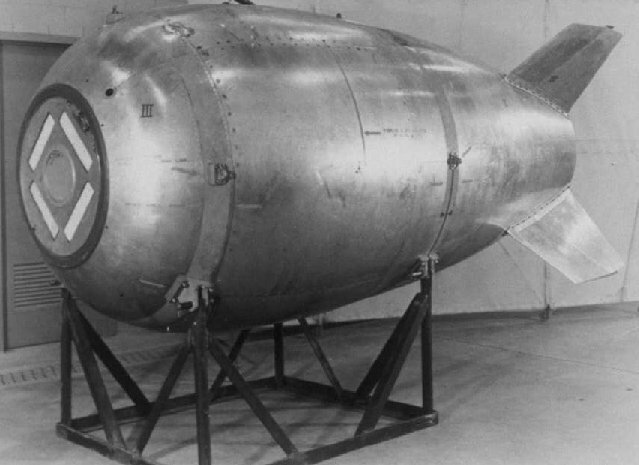 To Nuke... or Not to Nuke? 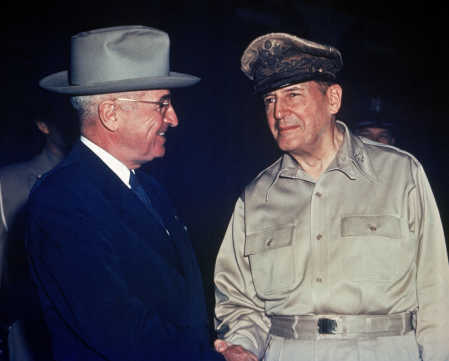 Soon, two sides were drawn: President Truman vs. General MacArthur. MacArthur wanted to expand the war to China, blockade the Chinese coast, and nuke them... something Truman did not want. Truman told MacArthur that he was expected to fight a "limited war" (which is sort of like trying to beat up a bully with one arm and one leg tied together). MacArthur tried to go over Truman's head by bashing the President and writing letters to newspapers. Truman soon had enough. As Commander-in-Chief of the U.S. military, Truman flexed his muscle and fired MacArthur. Many Americans were outraged, especially since 69% supported MacArthur. ​When MacArthur returned from Korea, he gave an address to Congress, of which his line "Old soldiers never die; they just fade away" remains one of the great exit lines in U.S. history. 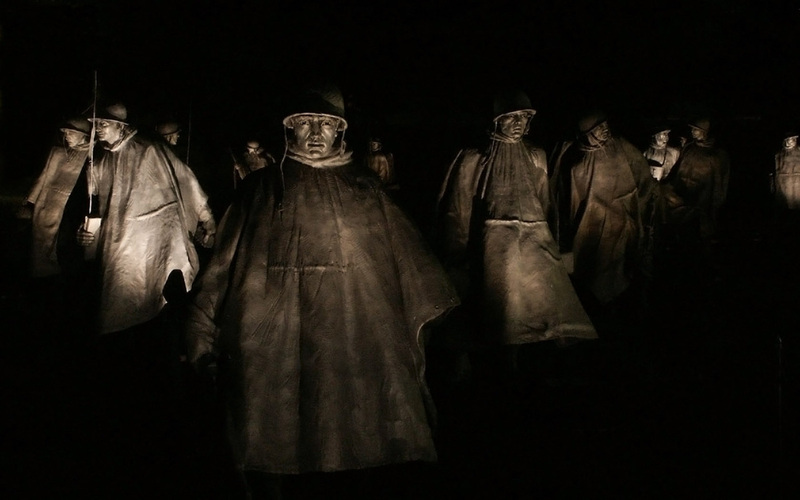 By the summer of 1951, the Korean War settled into a pattern it would follow for the next two years: bloody fighting along the 38th parallel, most of it in trench warfare similar to what was seen during World War I. Some of the bloodiest battles took place on hills called Old Baldy, Capital, Pork Chop, T-Bone, and Heartbreak Ridge. 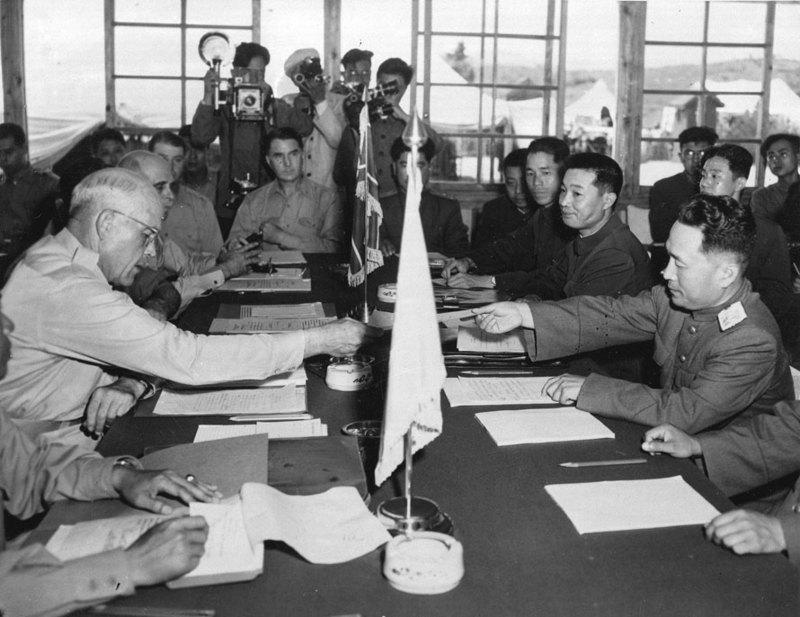 Not until July 27, 1953 did the UN, North Korea, and China signed an armistice agreement to end the fighting. (South Korea refused to sign.) The armistice, which occurred while Truman's successor Dwight D. Eisenhower was fresh in office, called for the creation of a buffer zone 2.5 miles wide across the middle of Korea. This "demilitarized zone" (or DMZ) was, in fact, heavily fortified. Because South Korea refused to sign the peace treaty, the two Koreas technically remain at war to this day. As a result, the U.S. still has 37,000 troops stationed in South Korea (but not the same ones... they got old - and cranky). 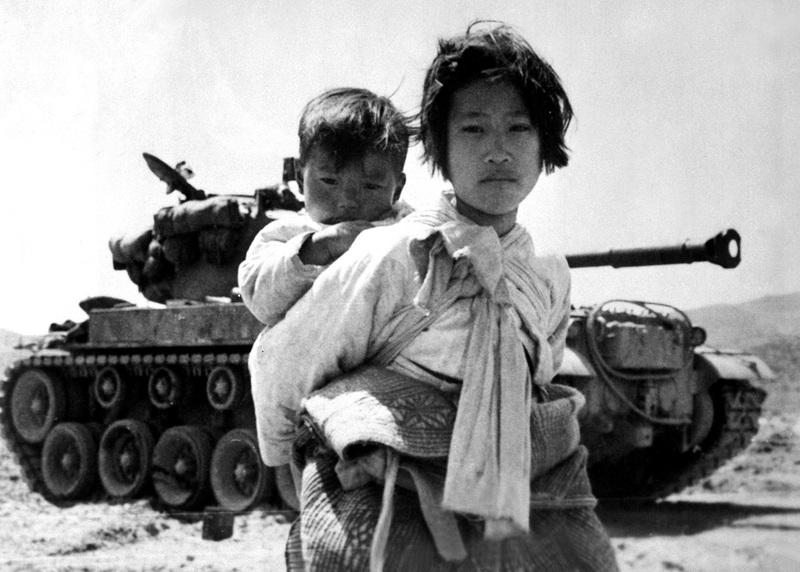 The Korean War was one of the most destructive conflicts of the 20th Century. 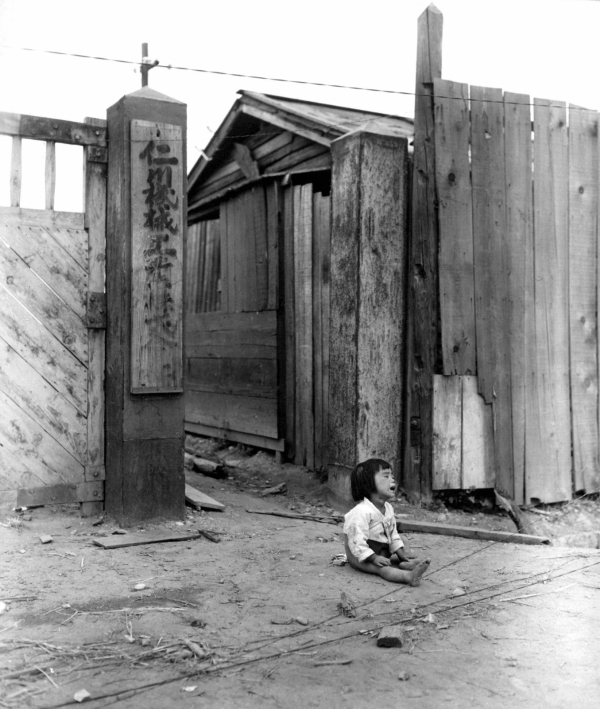 As many as four million Koreans died, of which two-thirds were civilians. China lost up one million soldiers, and the U.S. suffered 157,530 total casualties, including 54,246 dead (33,741 KIA) and 103,284 wounded. 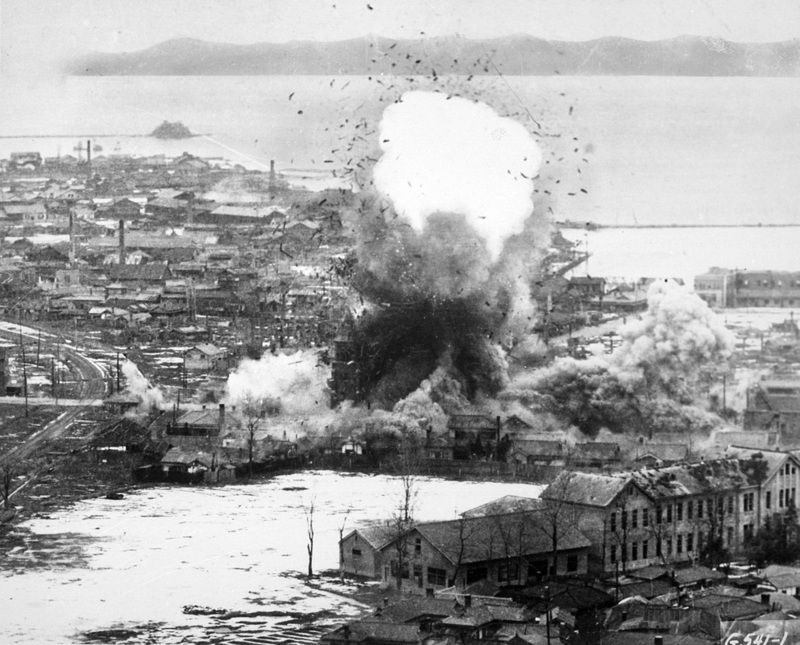 As a whole, 80% of Korean factories, 75% of government offices, and 50% of all houses were destroyed. The war left the peninsula permanently divided with a garrisoned pro-Communist, totalitarian led state in North Korea and a pro-American, semi-free (though not always democratic until the late 1980s) republic in the South. 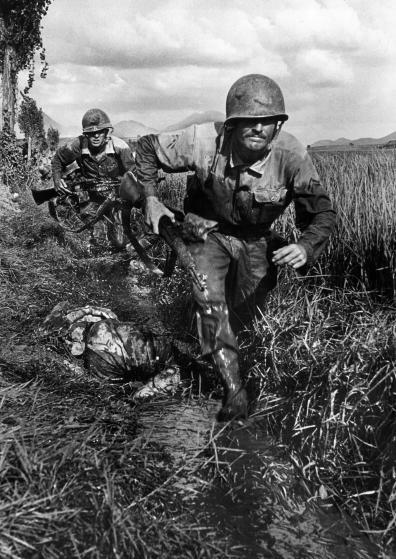 The Korean War has often been referred to as the "Forgotten War" or the "Unknown War" because it came on the heels of World War II and was overshadowed by the Vietnam War. Because the Korean War only lasted three years, it is not thought of as significant and often goes unmentioned in classrooms and textbooks. 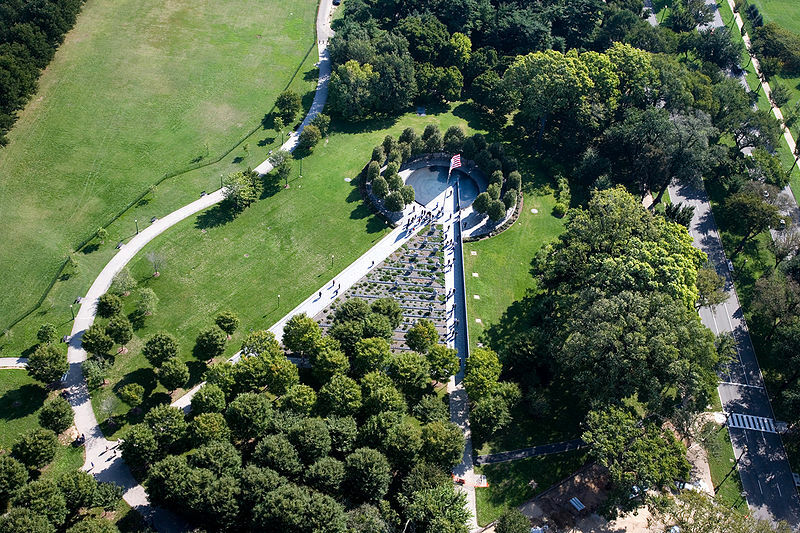 In 1995, the Korean War Veterans Memorial was built and dedicated to veterans of the war. 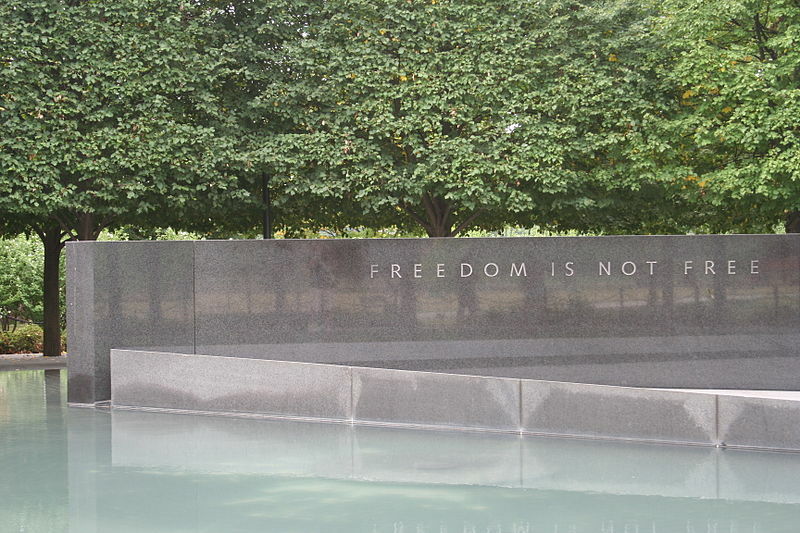 The memorial hopes to remind Americans that no conflict involving U.S. soldiers should be forgotten... and no life lost should be in vain. We often run into references to the UN and NATO during the Cold War. So, what's the difference? Every country sits in the General Assembly where they voice concerns and vote on minor issues. However, the Security Council is where you want to be - it's the adult table. The Council's decisions are binding on all UN members. The Council has 15 members; 5 have permanent seats while the Assembly elects the other 10 members for two-year terms. The 5 permanent members are the U.S., Britain, France, Russia, and China. 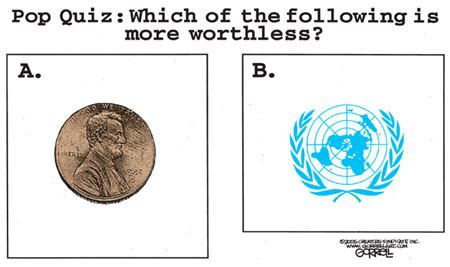 (These countries were the winning powers at the end of World War II when the UN was created.) Decisions of the Council require 9 votes out of 15, but any one of the permanent members can veto an important decision. This created problems during the Cold War because the Council was often deadlocked since the U.S. and Soviet Union never agreed. 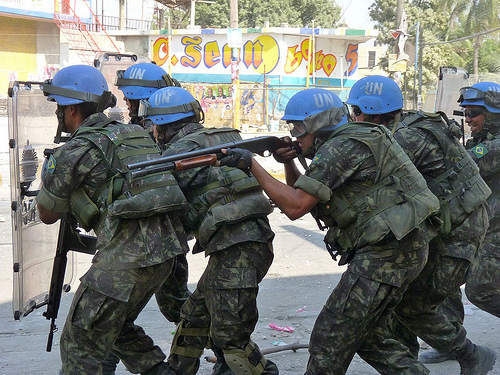 Today, the UN is used to settle disputes among countries or send in "peacekeeping" troops (made up of soldiers from different countries) after cease-fires have been ordered. The U.S. contributes more to the UN than any other country: 22% of the regular UN budget and 27% of the peacekeeping budget. 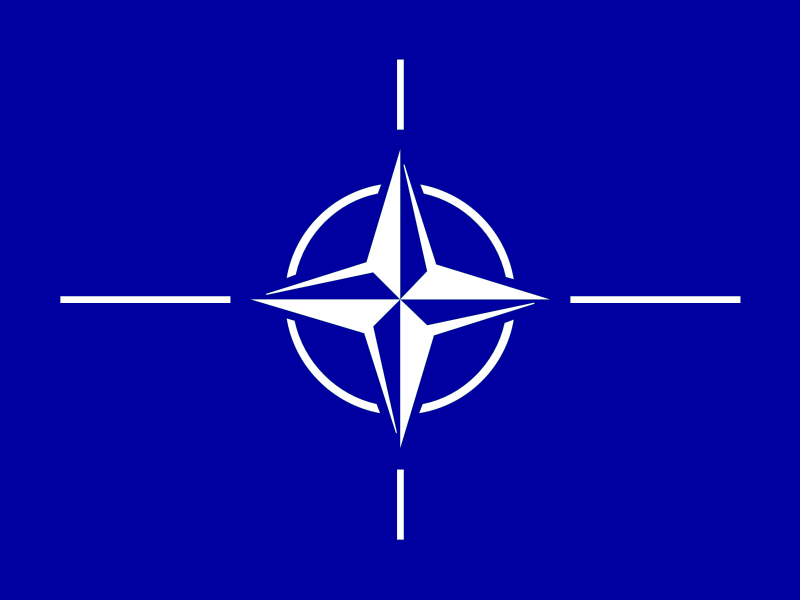 The North Atlantic Treaty Organization (NATO) was founded on April 4, 1949 at the start of the Cold War. The original purpose of NATO was to defend Western Europe against possible attack by Communist nations led by the U.S.S.R.
that acts as a stand-alone military available for rapid deployment by NATO. The U.S. contributes 25% of NATO's budget. The original members were Belgium, Canada, Denmark, France, Iceland, Italy, Luxembourg, The Netherlands, Norway, Portugal, the United Kingdom, and the U.S. Currently, there are 28 countries in NATO. Its headquarters is in Brussels, Belgium. A Mobile Army Surgical Hospital (or MASH) performs surgery behind the front lines. They were established in August 1945 and were deployed during the Korean War. A seriously wounded soldier that made it to a MASH unit alive had a 97% chance of survival. The 212th MASH was the last one left and was established in Iraq during Gulf War II (2003-2011). In the U.S., the most famous artistic depiction of the Korean War is M*A*S*H, originally a novel, and later a movie (1970) and TV series (1972-1983). All three versions depict the misadventures of a M*A*S*H unit as it struggles to keep its sanity during the war by way of humor and hijinks. There were a few flaws, the most notably of which was the fact that the TV series lasted for 11 years... while the actual war lasted only three. 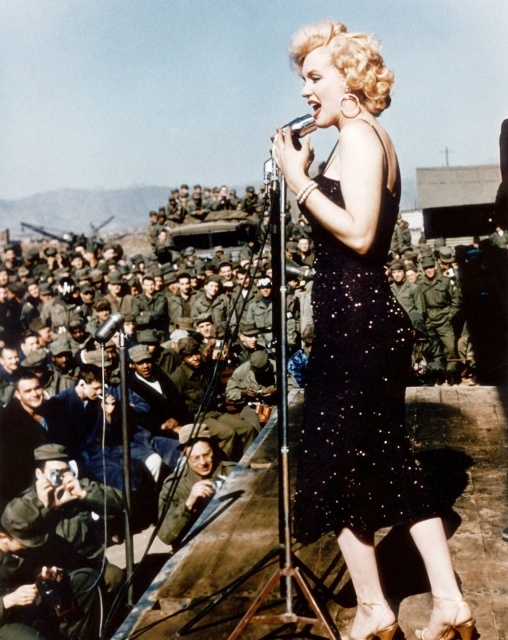 This also gave the show's writers the chance to take shots at U.S. decisions in Vietnam by disguising them as story lines for their show about the Korean War. 1948 orders were carried out varied among the branches of the military, with segregated units still in deployment at the start of the conflict, and eventually integrating towards the end of the war. First Lieutenant Bev Scott, an African-American officer, said, "There was no better institution in American life ... than the army for the black man in the Forties and Fifties ... You had more leverage in the Army. You always had somebody you could go to and complain about bad treatment. A black man couldn't do that in civilian life, especially in the South." 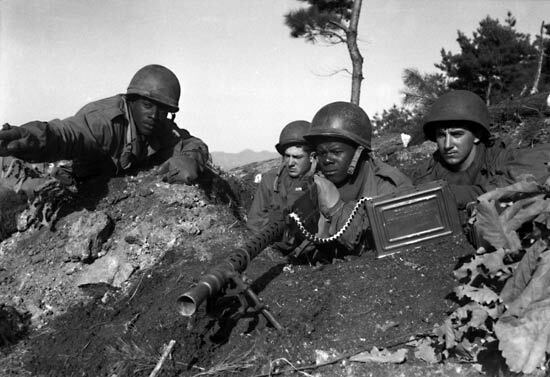 African-Americans served in all combat and combat service elements during the Korean War and were involved in all major combat operations, including the advance of UN forces to the Chinese border. 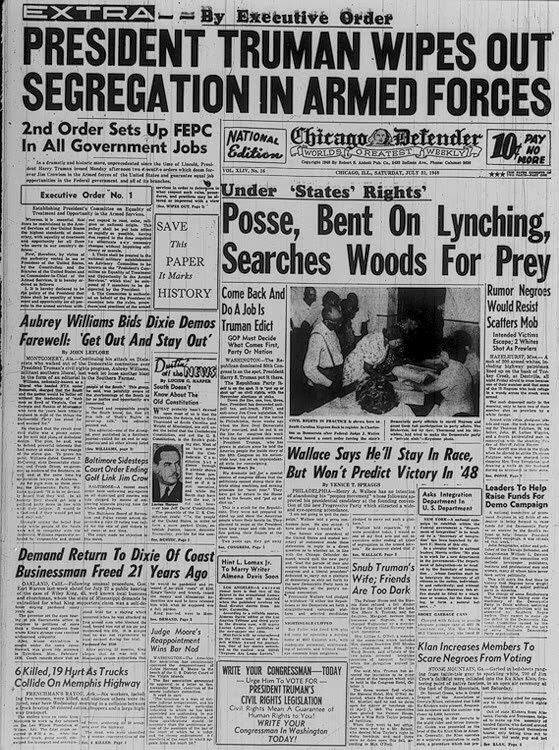 In June 1950, almost 100,000 African-Americans were on active duty in the U.S. armed forces. 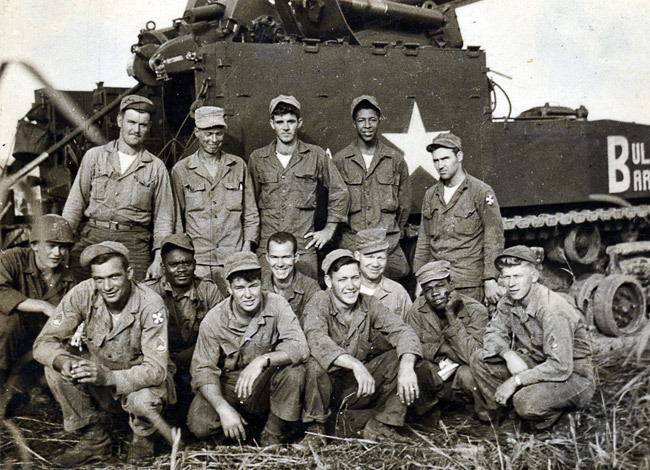 By the end of the war, over 600,000 African-Americans had served in the military. The following maps help explain the different phases of the Korean War. 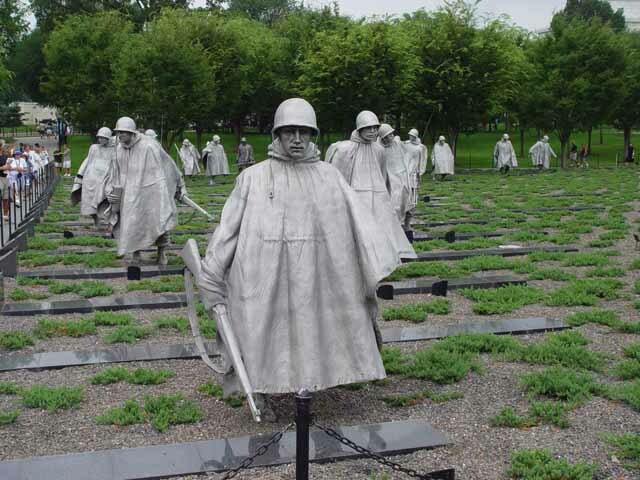 The Korean War Veterans Memorial is located in Washington, D.C. On July 27, 1995 (the anniversary of the armistice), it was dedicated to those that served in the conflict. The memorial is in the form of a triangle and intersects a circle. There are over 2,500 images sandblasted onto the granite walls. Within the triangle are 19 stainless steel statues that are over 7 feet tall and weigh 1,000 lbs. The figures represent a squad on patrol, drawn from each branch of the armed forces. They are dressed in full combat gear, dispersed among bushes and plants that represent the terrain of Korea. 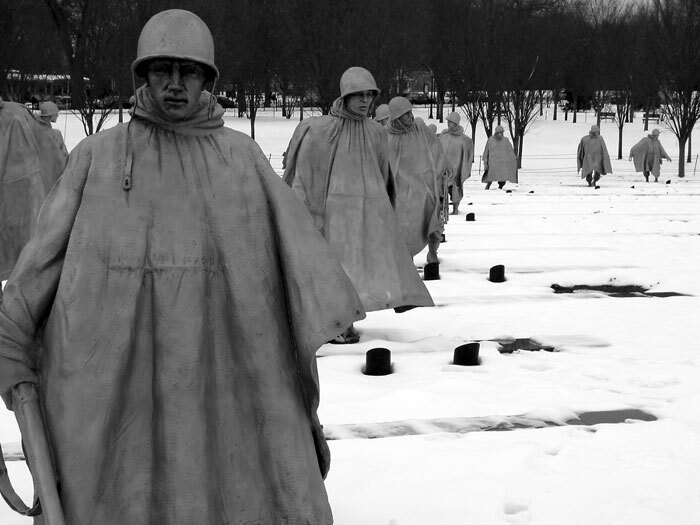 When reflected on the wall, there appear to be 38 soldiers, representing the 38th parallel. 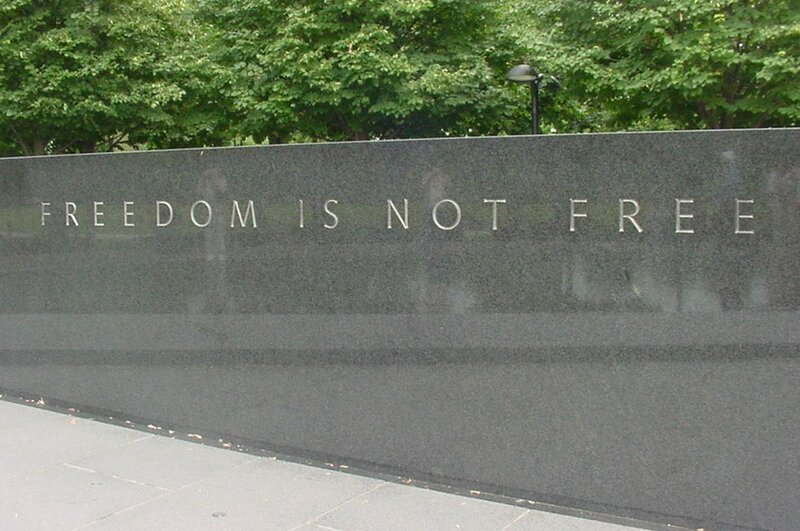 One of the memorial's walls contains the iconic saying "Freedom Is Not Free". * 17,730 of these deaths occurred outside the Korean theater.